Our clients vacant property sold. Our protection of this 1.5 mil property helped maintain its market value. The new owners saw no need for security services. 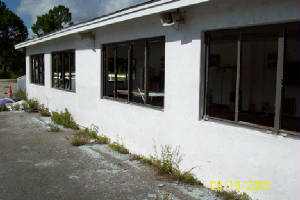 Within 2 weeks every window and door in the buildings that we had maintained as safe were busted out. The value of the property has fallen to about 750,000.00. An expensive and avoidable loss for the new owner. See below picture. 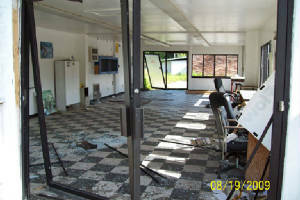 In 2003 Advanced Tactical Security began offering a commercial security check service to the banking industries foreclosed and vacant properties. To visually check their interest and document forced entry, storm damage, etc. In view of our current national financial trend, I predict that America will be near or in a serious economic and active foreclosure era by the end of 2009. This will directly effect financial institutions and mortgage companies. Financial institutions will be facing a very real and costly increase in foreclosures and/or unoccupied properties and the increase of unauthorized entries (break-ins), damage to properties, homeless intruders (squatters) and the added liability exposure this brings the institutions holding these properties. We are now offering a similar home security check service to financial institutions, mortgage companies and Banks. We can provide the qualified and insured personnel to check these properties that stand in financial limbo. This service will save financial institutions, mortgage companies and Banks hundreds of thousands in propery damages and personal liability law suits. We inspect and document (photos) each property. We note any unusual characteristic, broken window, torn screen, damages, etc in our initial inspection for comparison in following inspections. We check each property and document our presence with time and date stamped photos and notations on a regular basis. We check for signs of forced entry and document any or all damages. We check for the homeless (squatters) who take advantage of unoccupied homes/commercial properties and stand by for the Sheriff or Police to enforce our trespass eviction, or arrest and document all actions. We provide to our Clients regular reports concerning their properties and any actions that needed to be taken. We make available to our Clients a secure file for each property that we inspect. Our service can save our clients hundreds of thousands of dollars in losses and the liability exposure that could cost millions. Our service also adds extra value to our clients overall business relationships and in some cases attract new clients when you can extend our seasonal residential security checks to your clients. Electronic security alone cannot provide the protection or peace of mind that our ATS Assets Protection Inspectors accomplish in their well documented visits. Together we can create a serious impact in the reduction of crime in our area and provide a more secure environment for our new residents and commercial cliental. Please call now, tomorrow may be too late.